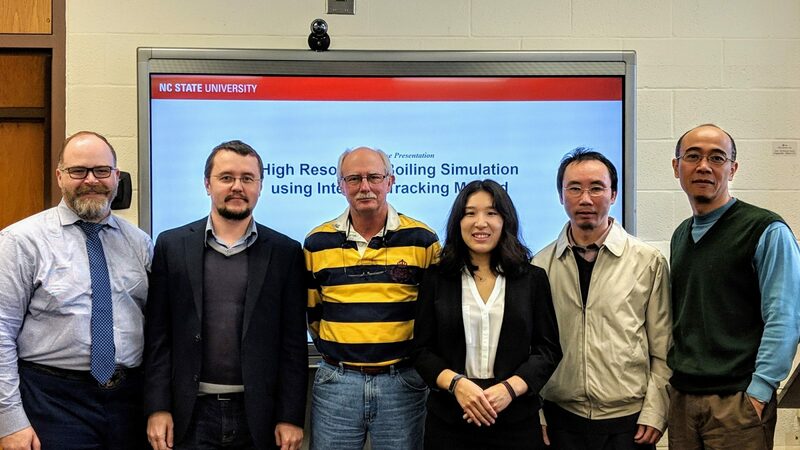 On January 3, Mengnan Li successfully defended her PhD dissertation, High Resolution Boiling Simulation Using Interface Tracking Method. Mengnan’s committee consisted of her advisor, Igor Bolotnov, and members, J. Michael Doster, Nam Dinh, William Pointer, and Hong Luo. Li, Mengnan. High Resolution Boiling Simulation Using Interface Tracking Method. (Under the direction of Dr. Igor A. Bolotnov). Boiling, as one of the most efficient heat transfer mechanisms, is widely used in various engineering systems. Better understanding and modeling of this process remains a major challenge in multiphase flow research. In light water reactor (LWR) nuclear power plants, the distribution of vapor in the reactor core sub-channels affects the heat transfer rate and may cause unfavorable conditions, such as departure from nucleate boiling (DNB) phenomenon. DNB, in turn, may cause fuel cladding damage, which may lead to reactor unplanned shutdowns and even accidents. The advances in High-Performance Computing (HPC) in recent years make it possible to apply direct numerical simulation (DNS) approach to a wide variety of bubble hydrodynamics and thermodynamics studies. After the interface tracking methods (ITM) are introduced to DNS, the instantaneous velocity and temperature field at, and around, the interface can be calculated in two-phase flow simulations. ITM approach provides not only detailed physical description associated with thermal and hydrodynamic processes but also the shape of the evolving interface, which may provide new insight on the understanding of boiling phenomenon and help the model development for multiphase computational fluid dynamics (M-CFD) in the near future. The high resolution boiling simulations in the presented research are conducted in full three-dimensional (3D) transient representation with the unstructured grid. This approach allows us to investigate the boiling phenomenon in various conditions with lower computational cost (by utilizing local mesh refinement for bubble growth region). The bubble dynamics information including bubble trajectory, growth rate, etc. is collected individually for each bubble. To the author’s best knowledge, it’s the first time that an ITM-based CFD tool can conduct boiling simulations with 3D unstructured mesh. To represent more accurate contact angle during nucleate boiling, the contact angle force model developed in the research group has been coupled with the evaporation and condensation algorithm. The Bubble Tracking Algorithm (BTA) which collects the detailed information regarding the individual bubble behavior in level-set method is brought into the evaporation and condensation model to support multi-bubble growth simulations and collect heat transfer information of interest (e.g. evaporation heat flux, bubble departure diameter, etc.) under various boiling conditions. The verification of the evaporation and condensation model has been performed by comparing the bubble growth rate with analytical solutions. Both pool boiling and flow boiling simulations are performed with the ITM boiling model in PHASTA. The simulated bubble nucleation frequency in pool boiling simulation is validated against experimentally-based correlations. The bubble evolution and growth rate is compared with experimental data to validate the model performance under flow boiling condition. The multi-bubble flow boiling simulation explores the potential of current model in solving boiling problems with complex geometries. The presented research lays the foundation of high resolution boiling simulation in PHASTA and demonstrates the potential of this approach in solving boiling problems and its suitability for future engineering application.